Senator representing Kaduna Central, Senator Shehu Sani has said he will dedicate a quarter of his salary to over 100 Internally Displaced Persons (IDPs), from Borno, Yobe and Adamawa states who flee their homes due to insurgency activities who are now taking refuge in Kaduna. He said he will also dedicate the period which he will serve in the Upper Chambers to see that the children have their dreams realized. 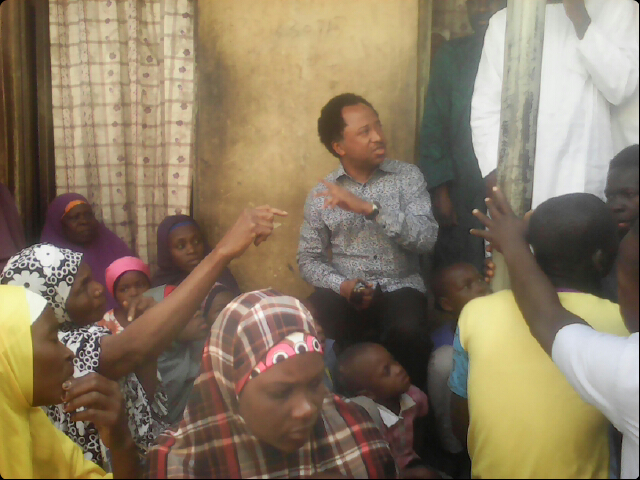 Senator Shehu Sani made the declaration during a visit to the IDPs’ camp in Badarawa, Kaduna North Local Government area of the state on Sunday. The senator why personally distributing honey and bottles of Yoghurts to the IDPs, hinted that he got the news that there was a substantial number of IDPs in Kaduna, and as a senator representing the State, it’s obligatory of him to intervene. “I got the news that we have substantial number of IDPs here in Kaduna. And as a Senator representing this very city, it is incumbent of me to intervene; and the intervention should be in such a way that I have decided to rent a house for them and also dedicate a quarter of my salary for the IDPs’ upkeep, education of their children, and for general support for all them in Badarawa. “These people are Nigerians, they’re part of us and we’re morally bound to support and help them. I will dedicate the period which I will serve in office to see these children have a future and their dreams realized. “I believe Nigeria has enough to support these people yo get their lives back. I’m here to offer moral and financial support not just for a day or two but to continue to support them so that the women among them can have their lives back. And the children can also have their future. “These women have lost their husbands and children. They’re widows and orphans and there’s nothing we can do that’s enough to get them out of where they find themselves. I’m pained by the continuous situation of the IDPs. “I’m very much disturbed that these persons are victims of insurgency that continue to threatened our peace, lives and freedom. The plight of these IDPs is a moral burden on all Nigerians. As long as they continue to remain in this position, we are morally at guilt to support them and also free them from the situation they find themselves,”he said.